I am an Assistant Principal at Mooresville Middle School in Mooresville, NC. We are one of seven schools in Mooresville Graded School District (MGSD), known nationally for our digital conversion, where every child in grades 4-12 is issued a MacBook, all grade 3 students receive a laptop for their use while at school, and grades K-2 students have laptops and iPads on carts. As an Assistant Principal, my staff and I work very hard to ensure that our teachers not only have a great selection of quality tools, but also have access to professional development (PD) and ongoing support to optimize their use of these tools to support student achievement. 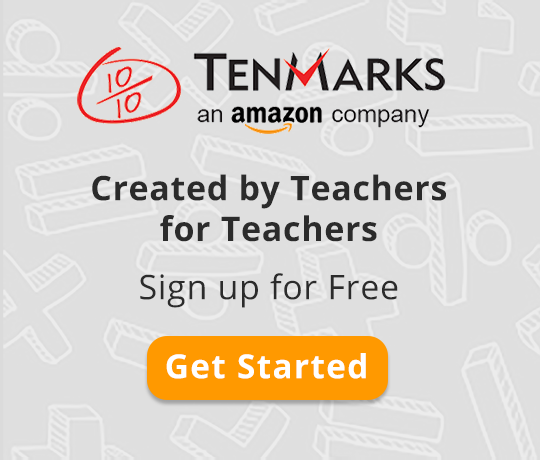 TenMarks Math is one of the quality math resources we offer our teachers. I like that TenMarks Math challenges our students to really think. The rigorous assignment questions force students to apply concepts in different ways, and we’ve seen that this exercise has a positive impact on end-of-quarter and end-of-year assessments. However, even the easiest of EdTech resources takes time, both to sell initially and to help teachers get up and running. Our staff is thoughtful about how we introduce new tools. They provide training and support to ensure that these resources are being used effectively. Teachers begin with district-wide PD. This happens at the beginning of the school year. One of our fantastic teachers, Ms. Snyder, leads the training in partnership with our trainer from TenMarks. In this initial training, teachers learn the basics of how the program works, how to log in, how to get started with assignments, and how to use the curriculum planning resources, TenMarks Math Lessons, to close gaps in instruction. Once the basics are covered, we spend a good part of the time applying real scenarios to allow teachers time to practice how to read reports to determine what to do next to give students exactly what they need. MSGD holds a Summer Institute every year so that staff can come together, share best practices, and kick off the new school year right. During this 3-day workshop, teachers choose to attend different sessions for general PD or to learn more about some of the EdTech tools we offer. TenMarks Math-focused sessions are really effective during this time because teachers that may have missed initial onboarding and training can get what they need, while those that are ready for more can find more insight about the TenMarks offerings. My staff and I look closely at end-of-quarter data in conjunction with TenMarks Math reports to understand which teachers are using the tool effectively. Reviewing end-of-quarter data first, we can see, at a high level, which teachers are struggling and which teachers are exceling. Then, by reviewing reports from TenMarks Math, we can see which teachers are using TenMarks the most and cross-reference this data with the end-of-quarter data. In most cases, we see that, in the classrooms where students are struggling, teachers aren’t using TenMarks Math. With this information, we work with the teachers who are using the tool effectively to learn best practices. Then, we can work with teachers who are struggling to help them implement TenMarks. We start with goals that are attainable, such as using TenMarks on a weekly basis, and then look for ways to increase usage over time. Professional Learning Communities, or PLCs, are huge at Mooresville. PLCs meet once per week. It is in these communities that math planning starts. Teachers are able to collaborate with each other to understand what kids need to know based on standards and to look at what tools they have to meet the goal according to the standard. PLCs are a great place for teachers to share new features within TenMarks Math that have been particularly impactful in their classroom. Additionally, for new teachers who join our staff halfway through the year, we rely on PLCs to help get them up to speed. It is empowering for teachers to support each other, and It is much more effective for suggestions to come from peers. I am always looking for tips to help teachers get started with tools in their classrooms. Right now, I am urging my teachers to incorporate TenMarks in the classroom during stations. I am a big believer in encouraging kids to move while they are learning, not only to increase oxygen to the brain, but also to keep them engaged. I like that, in this setting, students also get the personalized practice they need and that teachers see the benefit of using this program quickly. This ongoing support can lead to more effective adoption of TenMarks in the future. We have seen great results with this approach. I am confident that, if we continue to make time for these programs and allow teachers to learn from each other, we will see great growth in our math students. Do you have other suggestions to support teachers with new EdTech tools? Share with us in the comment section below. Justin James is an Assistant Principal at Mooresville Middle School in the Mooresville Graded School District. He works with professional learning communities for both 7th and 8th grade math. Mr. James leads district training sessions for TenMarks Math and works with teachers to effectively implement the program into classrooms on a daily basis.